Going through a divorce, or separation, is one of the most stressful activities that you can possibly undertake. Miams Family Mediation can help. Contact us today! Going through a divorce, or separation, is one of the most stressful activities that you can possibly undertake. Psychologists have shown that any change in a person’s life can lead to stress, particularly splitting from a long term partner. As well as the inevitable disruption to your personal, and social, life there are also consequences for your children and finances. Children, and other members of the family, are inevitably impacted by the results of divorce. There will be issues such as contact and custody of children to resolve. In addition to this, you will need to consider financial issues such as the division of assets including the family home and other assets such as shares and pensions. The consequences of divorce extend beyond the current livelihoods of the people directly involved, and extend to the rest of the family, as well as impacting upon financial considerations. 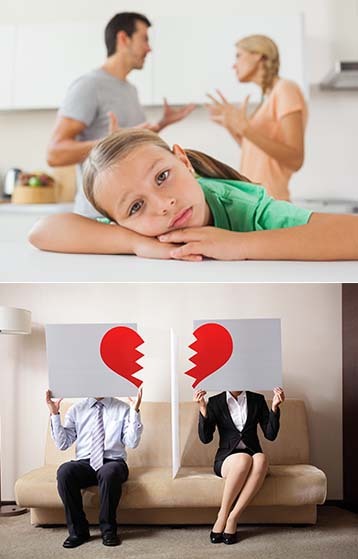 As part of the service we offer at FAMILY MEDIATION 1 we make the divorce process, and associated mediation, considerably less complex and stressful for all parties concerned. Mediators are not counsellors or therapists. They will not be able to help you with the emotional, or relationship issues, involved in a divorce. However, they are trained professionals who are experienced in resolving issues between couples. A mediator is like a good referee at a football match. It is their job to be impartial and not to take one side or another. The purposes of mediation are to achieve an agreement between a divorcing couple which covers the major areas of dispute between them, particularly as this relates to issues involving children or finances. This can be either a short, or lengthy, process dependent upon the extent of the issues between the separating couples and their willingness to resolve them. 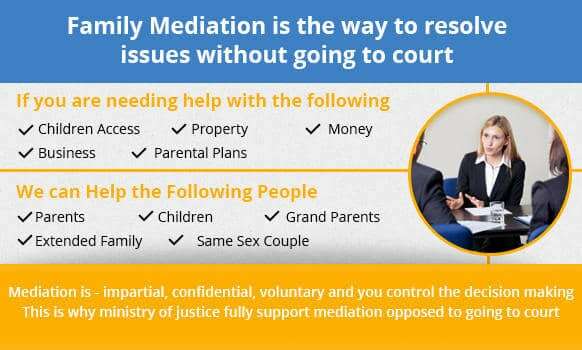 You will find the mediators at FAMILY MEDIATION 1 to be professional, experienced and friendly. In such a fraught environment, the first recourse is often to turn to the legal system. Although solicitors and lawyers have their place, as a first intervention their presence can do more harm than good. Aside from the cost of legal proceedings, which can be extremely heavy, there is the adversarial nature of the process to consider. What seem now to be minor issues can soon snowball to become major legal disputes. In these circumstances you need to think of alternatives. FAMILY MEDIATION 1 can help you to understand all the plausible alternatives. A mediation process can help you to resolve your divorce issues quickly and amicably.